How Can Pomegranate Juice Help With ED? Pomegranate juice for ED might sound a bit strange, but new studies are showing that this antioxidant powerhouse might just help with this condition. Men dealing with mild to moderate symptoms may experience an improvement when consuming the pure juice, according to the research. 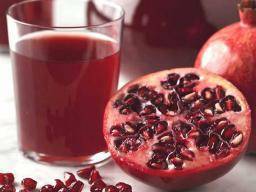 47% of those using the pomegranate juice noticed improvements, in comparison to 32% of those using the placebo. While further study is needed, researchers believe that this fruit juice exhibits real promise for addressing impotence in men. It's not surprising, as many natural treatments for erectile dysfunction have shown a lot promise. How Does Pomegranate Provide These Benefits? Researchers believe the juice is beneficial because its high levels of antioxidants counteract free radicals (toxic chemicals) that may be crippling circulatory function. In other studies, a link has been shown between pomegranate juice consumption and increased blood flow. It's interesting to note that the juice contains about 3 times more antioxidants ounce for ounce than beverages like green tea or wine, two other drinks touted for their high antioxidant content that may also provide some relief. Pomegranate juice has also been shown to reduce arterial plaque, which is another potential cause of erectile dysfunction. Other causes of erectile dysfunction include depression, diabetes, heart disease, nerve damage and endocrine issues. Because pomegranate juice is highly nutritious, it has the ability to affect many health issues that could lead to impotence. Among other benefits, it lowers cholesterol, supports the immune system and also has anti-cancer properties. It also is a potential aid in dealing with depression and osteoporosis. Although it is high in sugar like most juices, some research suggests it has minimal effect on blood sugar. Should You Try Pomegranate Juice for ED? Any attempt to address a singular health issue without looking at the overall balance of the body is unlikely to have long-term success. The many health benefits available to those who consume pomegranate juice make it a powerful, natural option for addressing erectile dysfunction and its potential causes. A glass of this powerful juice contains significant amounts of vitamins, folate, manganese and potassium. Men seeking to use pomegranate juice as a natural aid should consume 8 ounces daily, per the study. The best pomegranate juice will be labeled 100% juice on the label. The shorter the ingredient list the better, as additives only serve to water down and reduce the purity. Avoid juices that list malic acid or citric acid as ingredients. They are meant to hide the taste of a watered-down product. Why not try pomegranate juice for ED? At the very least you will be reaping the health benefits that antioxidants provide...so it's a win win any way you look at it.